"In this genre-bending YA thriller, will Sarah Merson's shiny new prep school change her life forever or bring it to a dark and sinister end? When Sarah Merson receives the opportunity of a lifetime to attend the most elite prep school in the country-Sanctuary Bay Academy-it seems almost too good to be true. But, after years of bouncing from foster home to foster home, escaping to its tranquil setting, nestled deep in Swans Island, couldn't sound more appealing. Swiftly thrown into a world of privilege and secrets, Sarah quickly realizes finding herself noticed by class charmer, Nate, as well as her roommate's dangerously attentive boyfriend, Ethan, are the least of her worries. When her roommate suddenly goes missing, she finds herself in a race against time, not only to find her, but to save herself and discover the dark truth behind Sanctuary Bay's glossy reputation. 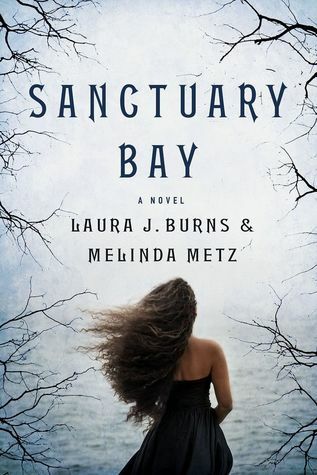 In this genre-bending YA thriller, Sanctuary Bay by Laura J. Burns and Melinda Metz, Sarah's new school may seem like an idyllic temple of learning, but as she unearths years of terrifying history and manipulation, she discovers this "school" is something much more sinister. " Daddy pressed his ﬁnger to his lips, shushing Sarah quiet as he slid the door to the tunnel back on. She wrapped her arms tightly around her knees and pressed her cheek against her arm, trying to pretend she was back in her own room. But it didn’t smell like her room. Even the spicy smell of Daddy’s cologne had faded now that the tunnel was closed. And grayness was all around her. She was almost four, and that was too old to be scared of the dark. But it wasn’t all dark. It was just gray dark. She tried not to think of monsters crawling toward her. Daddy said there were no monsters. But monsters liked tunnels. They liked little girls. Sometimes when she was scared she liked to sing the Maggie song. But that was against the rules. She had to be quiet. She had to be still. She had to wait until Daddy or Mommy opened the door and got her. Thinking about the rules helped. She could almost hear Daddy saying them, as if he was hiding in the tunnel with her. Even though he was way too big. If something bad happens, wait until the room is safe. If you leave the tunnel, put the funny slit- ted door back on. Run fast. Find a lady with kids. Tell her your name is Sarah Merson. Merson. Merson. Merson. Merson. Ask for help. Her nose started twitching, itching from the thick air. Mak- ing her want to sneeze. But she had to be quiet. Then she heard Mommy screaming. Mommy never screamed. Were the monsters out there and not in the tunnel? On hands and knees she started creeping toward the slits of light, heart pounding. Out there. Mommy on her knees facing the hotel room wall. Someone’s legs. A hand reaching down. A silver bird stared at Sarah from a ring on the ﬁnger. Stared with a horrible little black eye. The ﬁnger pulled the trigger of a gun. A bang. Her ears ﬁlling with bees. Mommy collapsing on the ﬂoor. Red spilling out. Sarah shoved her ﬁngers into her mouth. Quiet. The rule was be quiet. Shouting. Daddy’s legs running by, out of the room. The bird man chasing. The door banging closed. The room was safe. The bird man was gone. So she had to get out. Mommy was on the ﬂoor. Daddy was gone. She shoved the door and it fell out onto the ﬂoor. Near Mommy. Near the red. But the rule was to put the funny door back on. She picked it up and shoved it over the tunnel like Daddy had shown her. Sarah didn’t want to look at Mommy. She looked out the window instead. The window was always open and there was never a screen. Daddy’s voice came from the hallway, yelling. Screaming. Sarah pressing her hands over her eyes. Not looking. Not look- ing. Something bad happening. Daddy was quiet now. Something bad. She had to run fast. Sarah climbed on the chair under the window. The chair al- ways went under the window. She stuck her legs through the window and jumped down. Now run fast. She ran fast, looking for a lady with a stroller or a kid her age. A mommy would help her. She would say she was Sarah Merson. Sarah Merson, and something bad happened. About The Authors: Laura J. Burns and Melinda Metz have written many books for teens and middle-grade readers, including the Edgar-nominated mystery series Wright and Wong and the YA novels Crave and Sacrifice. They have also written for the TV shows Roswell, 1-800-Missing, and The Dead Zone. Laura lives in New York and Melinda lives in North Carolina, but really they mostly live on email, where they do most of their work together. Giveaway: Thanks to the fabulous people at St. Martin's Griffin, I am giving away one copy of SANCTUARY BAY to one very lucky winner. This giveaway is only open to US participants and ends 2/29 (Leap year, heeeey). Good luck, and may the odds be ever in your favor. This one's definitely been on my TBR list and it sounds great! Hi, I'm very excited sharing this amazing testimony about Dr Frank Ojo a spell caster who save my marriage and brought my husband back to me today.! A very big problem occurred in my Marriage seven months ago, between me and my husband . so terrible that he took the case to court for a divorce. he said that he never wanted to stay with me again,and that he didn't love me anymore.So he packed out of the house and made me and my children passed through severe pain. I tried all my possible means to get him back,after much begging,but all to no avail.and he confirmed it that he has made his decision,and he never wanted to see me again. So on one evening,as i was coming back from work,i met an old friend of mine who asked of my husband .So i explained every thing to him,so he told me that the only way i can get my husband back,is to visit a spell caster,because it has really worked for him too.So i never believed in spell,but i had no other choice,than to follow his advice. Then he gave me the email address of the spell caster whom he visited. TEMPLEOFLOVEANDPROSPERITY@GMAIL.COM. So the next morning,i sent a mail to the address he gave to me,and the spell caster assured me that i will get my husband back the next day. What an amazing statement!! I never believed,so he spoke with me, and told me everything that i need to do. Then the next morning, So surprisingly, my husband who didn't call me for the past 7 months, gave me a call to inform me that he was coming back. So Amazing!! So that was how he came back that same day,with lots of love and joy,and he apologized for his mistake,and for the pain he caused me and my children. Then from that day,our relationship was now stronger than how it were before,by the help of a spell caster. So, i will advice you out there if you have any problem contact Dr Frank Ojo, i give you 100% guarantee that he will help you.. Email him at: Templeofloveandprosperity@gmail.com .Name: Amanda Bryan, From: UK . Thanks for reading . What a special story. I was hurt and heart broken by my husband.! A very big problem occurred in my marriage seven months ago, between me and my husband . so terrible that he took the case to court for a divorce. he said that he never wanted to stay with me again,and that he didn't love me anymore.So he packed out of the house and made me and my children passed through severe pain. I tried all my possible means to get him back,after much begging,but all to no avail.and he confirmed it that he has made his decision,and he never wanted to see me again. So on one evening,as i was coming back from work,i met an old friend of mine who asked of my husband .So i explained every thing to him,so he told me that the only way i can get my husband back,is to visit a spell caster,because it has really worked for him too.So i never believed in spell,but i had no other choice,than to follow his advice. Then he gave me the Email address of the spell caster whom he visited. Templeofloveandprosperity@gmail.com. So the next morning,i sent a mail to the address he gave to me,and the spell caster assured me that i will get my husband back the next day. What an amazing statement!! I never believed,so he spoke with me, and told me everything that i need to do. Then the next morning, So surprisingly, my husband who didn't call me for the past 7 months, gave me a call to inform me that he was coming back. So Amazing!! So that was how he came back that same day,with lots of love and joy,and he apologized for his mistake,and for the pain he caused me and my children. Then from that day,our relationship was now stronger than how it were before,by the help of a spell caster. So, i will advice you out there if you have any problem contact Dr Frank Ojo, i give you 100% guarantee that he will help you.. Email him at: Templeofloveandprosperity@gmail.com ,or call his mobile number: +2348072370762 ,or visit his Web site to know more about him: http://africatemple.yolasite.com. Dr. Happy, you are indeed a miracle worker.I have tried so many spell casters and psychic after my husband left me. Dr. Happy was the only spell caster who could help me..For sure this is really an Ultimate temple where you can get back your ex lover. Dr.Happy cast a love spell and my husband changed for good, he made him a better man and distanced all his secret lovers. I am happy to have a united family, it couldn’t be possible without the effort of Dr.Happy. My husband is back with full of love and sincerity. Make contact with Dr.Happy for relationship help and you will have your heart desired granted email him through his Email address: howtogetyourexback@hotmail.com Susan Luther from USA.